In 1825 the first sod of the first Ballochmyle Quarry was cut by Mr David Lambie of Catrine having obtained a lease from Mr Claude Alexander. This would begin 130 years of quarrying in and around Mauchline. For the next 40 years Mr Lambie would walk from Catrine to Mauchline in the morning and walk home in the evening. The first quarry was in the field between the railway line and Haughyett farm. It worked only to a depth of 50 feet, being limited by a precarious zig zag roadway to remove the stone from the quarry. This quarry provided the stone for Mauchline Parish church which opened in August 1829. At this time the quarry was land locked with no easy means of transporting large quantities of stone out with the district. This all changed on 9th of August 1848 when Mauchline Railway Station opened for business. 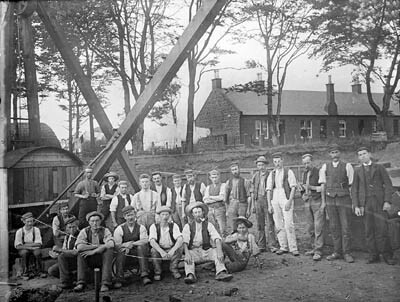 Immediately the quarries could expand now being connected by rail to the developing city of Glasgow, the industrial development of central Scotland and the British Empire. With the death of Mr Lambie in 1865 the lease passed to Mr William Gibson of Auchinleck. Upon his death the lease again transferred to his son-in-law Mr Marcus Bain. 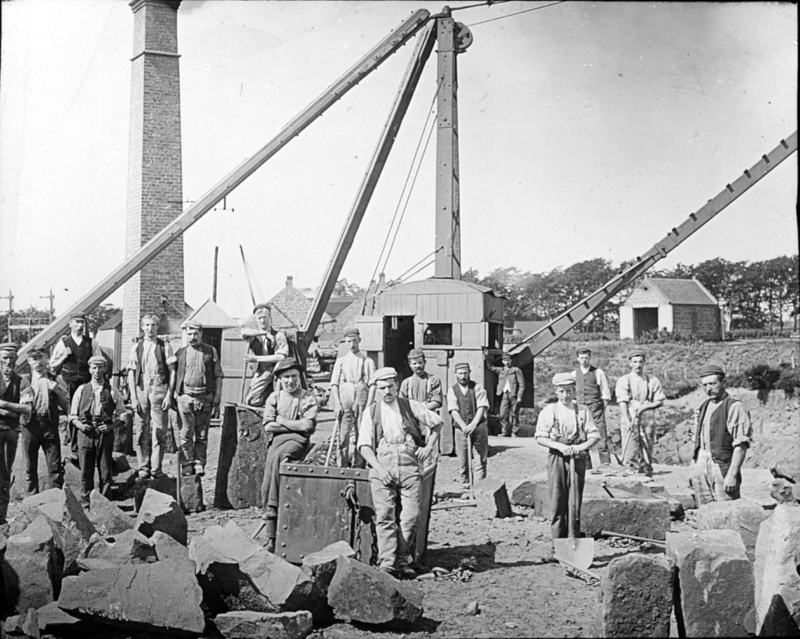 By 1891 under the guidance of Mr Bain the quarries were expanding and going much deeper to win sandstone. Sandstone is referred to by geologists as Permian Rock which covers an area of 16 square miles around the Mauchline basin. The shape of the rock formation has been described as saucer shaped with the deepest and best being found around Mauchline. The depth of the seam was unknown but the quarries worked down to almost 200 feet eventually. The quarrymen always worked in pairs and after cleaning off the top cover the stone was worked in 'Motions'. A motion measured about 100 square feet and would be marked out accordingly to the customer’s order of thickness and length. The quarrymen picked out a trench several inches deep around the 'Motion'. Then steel wedges were hammered in every 3-4 inches to cause cracking. The wedges were driven deeper by alternating blows to spilt the rock right down. Once spilt from the face the 'Motion' was pinched up at one end and a 'Bool' [large piece of whinstone'] was inserted to allow clearance for a drag line chain to be inserted. The Drag line chain was then attached to the main haulage rope and one of the six steam driven Derrick Cranes pulled the block free. As a result of the danger involved to his workforce by lifting such a heavy weight by chains or rope to the surface, Mr Bain decided that all lifting would be carried out by wire ropes and slings. This method undoubtedly saved lives as chains and rope haulage were much more likely to breaking under tension. Here was a very early example of 'Health and Safety' in the work place..!! The 'Motion' was then lifted out of the quarry and onto the 'Dressing Hill. The first quarry had long since ceased production but they had moved to the other side of the Glasgow/Dumfries railway line where they would sink another four quarries, two on either side of Haugh Road and all connected by rail. Three of these quarries went down to the 180-200 feet mark. The fourth never achieved near this size and appears to have been abandoned. However it was connected to the quarry rail system by a line which came through a gap in workers houses at Victoria Cottages. As Marcus Bain went deeper he found that a new quarry was dry to 110 feet deep. Then he encountered ground water. To get down another 15 feet required a pump with 2 five inch plungers pumping out water. To go another 20 feet deeper required a pump with two 9 inch plungers to cope with water flow. Finally around 1891 to get down to 180 - 200 feet required the installation of a bell crank pump with two 16 inch plungers with a capacity of 60,000 gallons per hour to keep the workings from flooding. This was an expensive piece of machinery to install and demonstrates the continued demand for sandstone blocks. After the stone blocks were lifted onto the 'dressing hill' they were placed on self feeding sawing frames powered by a steam boiler and cut to size. 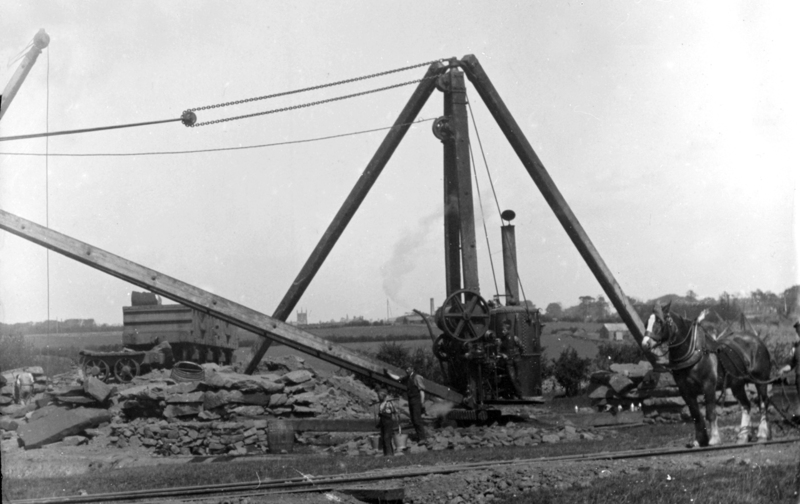 The quarries had two steam powered cutting frames each driven by a 12 horsepower steam engine. The cutting was done by strips of steel about a quarter inch thick at their base but with no teeth. The metal blades were cooled by water flowing over them as they moved back and forwards cutting through the blocks of stone. The stone was then loaded onto railway wagons for dispatch. Motive Power on the internal rail system up until the early 20th century was by horse. During the period 1883 until 1891 'Jamie' the horse moved 90,000 wagons around the quarry site. In the early 20th century horsepower was replaced by an Andrew Barclay 'Pug'. The Victorian and Edwardian periods were boom times for the quarries, but it all suddenly stopped in 1914 with the outbreak of the First World War. Building work ceased, men were called up, and the War Dept wanted buildings which were cheap and easy to construct. After the war finished construction was slow to resume and skilled quarrymen had been killed. The quarries eventually resumed quarrying stone again but on a much reduced scale. By the 1930's building bricks were being mass produced' they were much cheaper to make, easier to transport and quicker to construct. 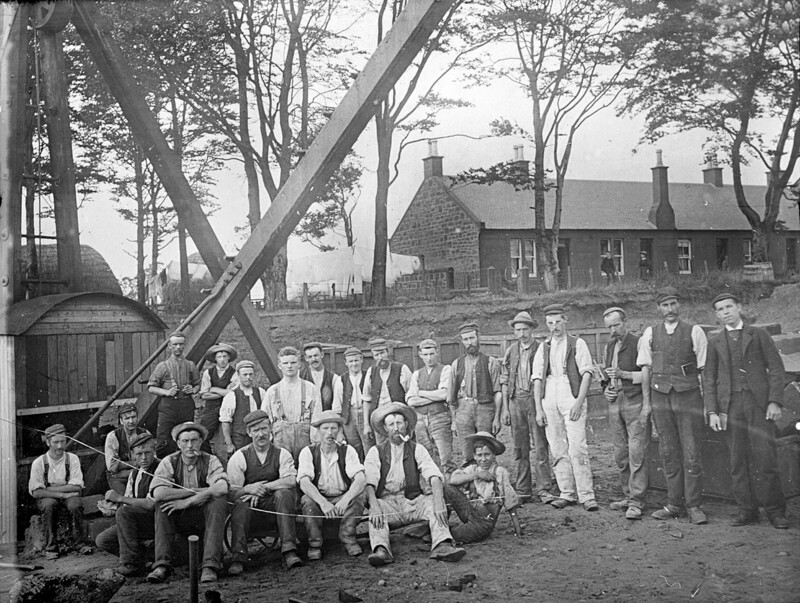 WORKERS AT VICTORIA COTTAGES, HAUGH ROAD. CLICK TO ENLARGE. The quarries attempted producing their own bricks made from the 'Shimmers' (waste from dressing the stone) which was crushed and mixed with lime. The bricks were then baked in a steam oven for several days to cure and harden them. They were never a success being regarded as to soft and prone to causing dampness. As a result of these problems only two blocks of houses in Kilmarnock Road, Mauchline were constructed with them in the late 1930's. A section of brick wall still remains today in the Haugh Road in Mauchline, where it was constructed as a loading point for the bricks onto road transport. The bricks were manufactured by The Ballochmyle Brick Company an off shoot of the Ballochmyle Quarries. Production again stopped at the start of World War 2, again the private construction trade stopped, men were called up to fight and the War Dept wanted quick and cheap buildings. Building bricks, concrete and wooden sectional buildings were all the rage. Sandstone took to long to build. The quarries were on their last legs but were saved by an unlikely building project of strategic importance. During the early days of World War 2, the runways at Prestwick Airport had to be lengthened for American B17 Flying Fortresses and B24 Liberator bombers flying into Britain from American bases via Greenland and Iceland. The material used came from the waste spoil bings of the quarries. Part of this job also included material for blast pens to protect the aircraft on the ground from aerial bombing. This material was moved both by rail but mainly by road to the airfield. By the end of World War 2, building with bricks and sectional prefab homes had dominated the building industry who were trying to provide cheap affordable homes to replace bomb damaged properties. Again the quarries were struggling to compete and provided stone for one off special house jobs, mainly sandstone fronts for bungalows in Ayr and Prestwick. This continued until the mid 1950's when the last working quarry at the rear of Mauchline Station Goods Yard finally ceased production. The last two employees were Jimmy Dunlop and Willie Gillies. In one last twist of fate one of the closed quarries was used to dump American Radial aircraft engines which had been stored at Prestwick Airport. The engines were made up of ferrous and non ferrous metals and the cost of stripping the engines to separate these metals was deemed prohibitive. By this time the 'Jet Age' had arrived and no one wanted piston engines, so they were dumped along with boxes containing possibly tools or spares. 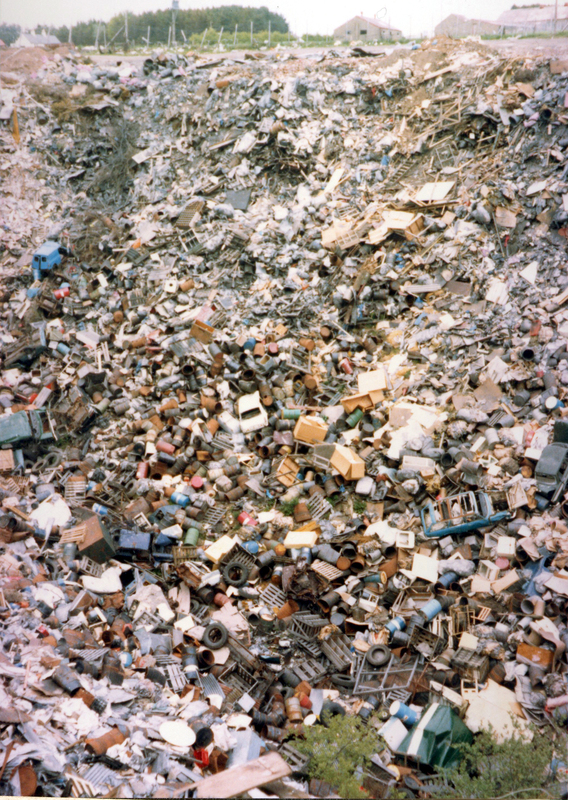 Every time a load was dumped officials were on hand to make sure it all went into the deepest part of the quarry. The lease for this quarry was taken on ground at the rear of Mosshead Farm, Mauchline by Baird and Stevenson, a Glasgow firm of Quarrymen. Quarrying began around 1890 and the quarry was connected to the Glasgow and South Western Railway by a narrow gauge rope worked incline which hauled bogie wagons up to a railway siding just north of Barskimming Road Railway Bridge. Here the stone was transferred to railway wagons and the spoil dumped just opposite Mauchline Cemetery. Traces of the incline are still visible today. This was probably the largest of all the quarries believed to cover an area of 5 acres. The quarry had ceased producing stone by the beginning of the First World War and local history has the workings flooding during a week-end when a pump left unattended broke down. Certainly when this quarry reached the water table it drew the water away from the Ballochmyle Quarries close by because of its location slightly further down hill from Mauchline. A newspaper article from November 1916 has the company dismantling plant, boilers, machinery and rail track to be used elsewhere. That’s all the information I have. Hope you like the story. INFORMATION GATHERED FROM VARIOUS ARTICLES, AND PERSONAL RECOLLECTIONS, INCLUDING FEB 1891 ARDROSSAN AND SALTCOATS HERALD ARTICLE.